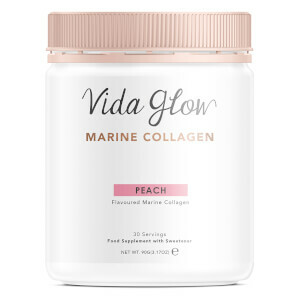 Vida Glow Marine Collagen Original Loose Powder is a 100% natural daily supplement that helps promote optimal collagen function. As we reach our mid-twenties, collagen production begins to decrease. Collagen is the second most prolific substance in our body, (behind water), so a natural supplementation in our diet is vital for keeping collagen levels healthy. Derived from the scales of Deep Sea Red Snapper, the pure marine collagen has a low molecular weight, which means it's highly bioavailable with an absorption rate above 90% (compared to pills and tablets which average 20-30%). Once ingested, it passes through the stomach lining and gets to work improving collagen production. Encouraging healthy skin, hair and nails, it will promote youthful-looking skin while assisting in muscle repair and recovery. The Original formula is free from taste and smell, making it easy to add into any food and drinks, such as porridge, yoghurt, and smoothies, or even tea and coffee. The powder is heat stable. Free from heavy metals, toxins and pollution. Complete with a 3g scoop for easy serving. Contains 30 servings. Free from wheat, gluten, sugar, dairy, parabens, additive, preservatives and flavours. Blend 1-3 scoops per day in your favourite food or drink.